Nach dem Release ihres Albumgs "Delirium" 2016 gehen Lacuna Coil auf große Europa-Tour und machen ein paar Mal halt in Deutschland, aber in den Niederlanden nahe der deutschen Grenze. Und nicht zu vergessen das Konzert zum 20 jährigen Bestehen der Band am 19. Januar in London. There is an old sanatorium up in the hills of Northern Italy. An old, abandoned, and decayed fortress whose corridors are filled with the ghosts of a thousand tortured minds and souls. A place where every wall still bares the scars of countless damaged lives. With their 8th studio album the Italian Gothfathers decided it was time to up the ante, switch into a heavy mode and finally take full creative control over every aspect of "Delirium". They created an audio-visual setting that is allowing for flashing glimpses of a dark place that will take their listeners on an entrancing trip. A trip, where they will decide if they are ready to open another door and fully engulf themselves in the "Delirium" experience - but just to finally find their ways out of this dark maze and come back invigorated. Or as LACUNA COIL say in their very own synopsis of "Delirium": "Delirium" is about the horrors that we must face in everyday life by exploring the unknown, and to one day, hopefully find the cure. After being heavily involved with previous productions Marco "Maki" Coti-Zelati took over the leading role as producer together with his fellow bandmates. 2016 shows LACUNA COIL including US drummer Ryan Blake Folden as a tight unit that realized their collective vision for "Delirium" at BRX Studio in their native Milan between December 2015 and February 2016. Yet again they were working with Marco Barusso (engineer, mix) who had not only worked with LACUNA COIL in the past on several albums such as "Dark Adrenaline" and "Karmacode", but also on Italian high profile artists like Eros Ramazzotti or Laura Pausini. Apart from several Italian friends as well as Barusso (who is a skilled guitarist himself) recording guitar solos for "Delirium" Mark Vollelunga of Nothing More added a solo to "Blood, Tears, Dust" while Myles Kennedy (Alter Bridge and many more) came up with a tailor-made one for "Downfall". 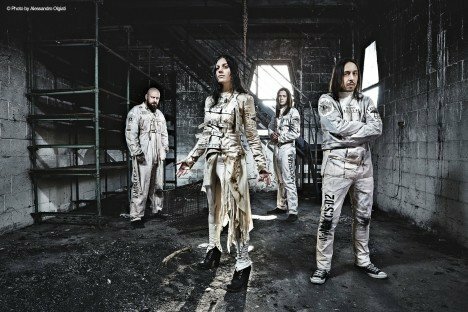 However, LACUNA COIL went even further with Marco "Maki" Coti-Zelati creating the artwork for "Delirium" himself, based on an atmospheric session captured by Italian photographer Alessandro Olgiati.